I love being part of the Access community, partly because this is a group of people that are always moving forward. Just three weeks into the series, "It Came From Within," and already you're asking, "What's next?" And I know why you're asking. You are thinking about a friend, family member, or co-worker that you'd like to invite to Access Church. And the start of a new series is such a natural time to invite someone. Well, I've got some great news. The next series is a lay-up. 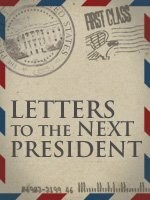 It's called "Letters to the Next President," and features three messages on leadership that any president, Republican or Democrat, can learn from. The fun starts October 12. We will not be endorsing any candidate or party. Instead, we'll focus on the virtue of good, solid leadership. Principles that can apply whether you are the president of a nation or a family business, whether you lead an army around the globe or to the bus stop. I guarantee you'll learn something new!